The Rushworth Chronicle building, Rushworth, is a single-storey brick steam-printing office. It was constructed in 1888 to house Robinson?s new steam printing presses. 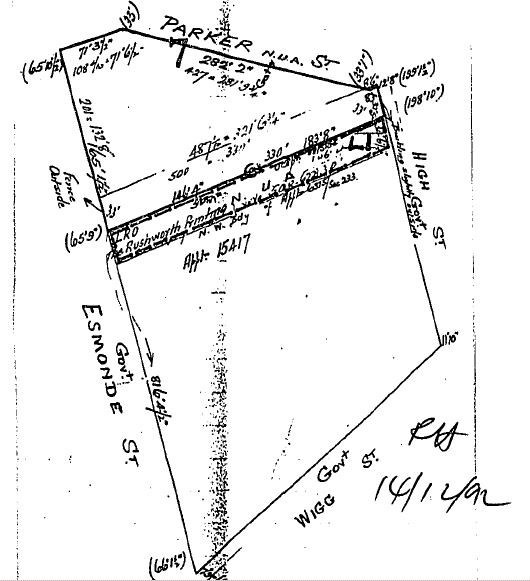 Rushworth was settled in the early 1850s as a result of a rush to the Rushworth gold field, but the town?s major growth came in response to land selection in the Waranga area from 1869. The Waranga Chronicle was established by Charles Robinson on 18 November 1869 and in 1886 changed its name to the Rushworth Chronicle; the short-lived Waranga Echo (1868-69) was its forerunner. The Rushworth Chronicle was one of the many newspapers that serviced local townships across Victoria in the nineteenth century. The introduction of the steam-powered printing press in the 1850s led to a marked growth in newspaper publishing in Australia; by 1888, there were 150 newspapers published across over 100 Victorian towns. The Rushworth Chronicle was printed from this building for 89 years, from 1888 to 1977; the paper ran continuously for a total of 108 years. The building comprises the editor's office, printing room and workroom; the verandah was reinstated in 1991. A rear timber residence was necessary for the hands-on needs of the newspaper. Original features include the central double-panelled door and original fenestration, gabled roof and simple pediment to facade with raised segmental arch entablature (that also includes signage). It is built of locally made bricks that bear the maker's traditional thumb-print. Internal elements associated with printing include the original steam printing press, the overhead belting system to the ceiling, the water pipes installed under the floor boards for cooling steam, an open fireplace designed to heat the type metal for the linotype, and newspaper storage shelves; the steam engine was removed in the 1950s. The survival of a range of ancillary equipment contributes to the integrity of the site, including typeface, belting and webbing. The survival and on-site storage of back runs of the newspaper demonstrate the importance of the site as a continuing historical resource. The Rushworth Chronicle building is of architectural, historical and scientific (technological) significance to the State of Victoria. The Rushworth Chronicle building is of architectural significance as one of the few surviving and relatively intact printing offices in the State. It retains important original features that demonstrate its function as a steam-printing office. The Rushworth Chronicle building is also architecturally significant as an example of Victorian (vernacular) building style. 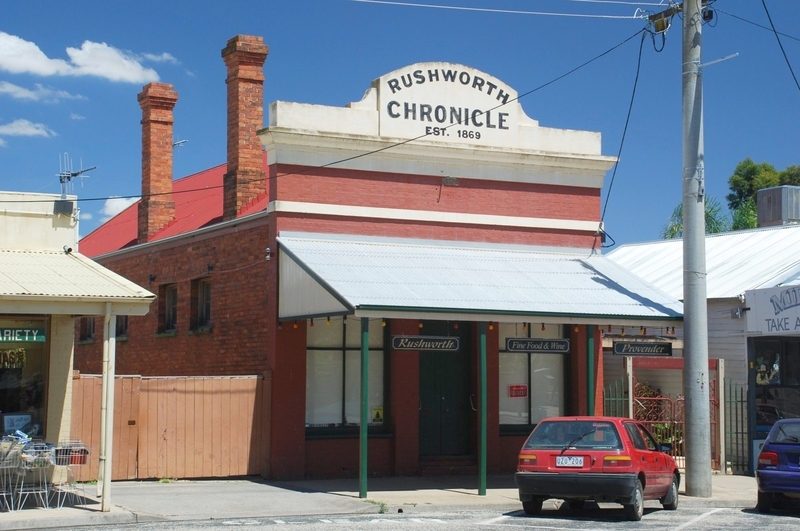 The Rushworth Chronicle building is of historical significance for its demonstration of the important role of local newspapers in Victorian country towns, and its long association with Rushworth's major newspaper. The Rushworth Chronicle building is of scientific (technological) significance for the survival of a number of elements associated with the printing works; their survival in situ contributes to the integrity of the site. 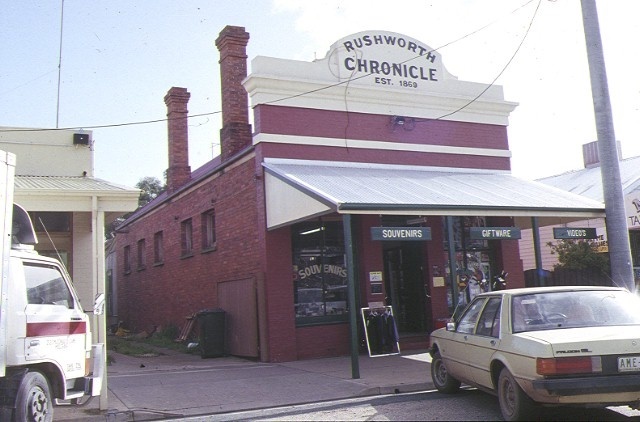 The Rushworth Chronicle building is of local historical significance because of the long and important contribution it has made to the local economy and livelihood of the township of Rushworth and the wider region. The Rushworth Chronicle building makes an important contribution to the Urban Conservation Area of High Street, Rushworth. The Rushworth Chronicle building is historically significant for its association with local newspaper owner Charles James Robinson. It is also important for its long association with the Muhlhan family; through the editorships of father Edwin Andrew Muhlhan 1903-17, and son Leslie Muhlhan 1917-24. In addition to the publication of the Rushworth Chronicle, the printing works provided a range of printing services to the local area. 1. All the buildings known as the former Rushworth Chronicle Steam Printing Office. National Trust of Australia (Vic. ), file no. 5658. Rushworth Chronicle, 20 November 1969. Colour postcard c.1890s shows the wording ‘Steam Printing Office’. Waranga Chronicle ran from No. 1 (18 November 1869) until no. 865 (9 July 1886). The Golden Years at Whroo (1981).